WILLEMSTAD - “As a medical university, we are committed to be involved in public health activities and providing community services to help and serve the local communit,” said Dr. Sateesh Arja of the Avalon University School of Medicine. As future physicians, this further educates Avalon students in building communication skills, professionalism and leadership skills. Avalon University School of Medicine conducted a health fair this past Saturday, July 15th, 2017 at the Sambil Mall in Veeris, and it was one of the longest health fairs on the island that went on for eight hours continuously. 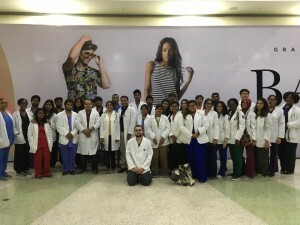 The health fair was conducted in association with the American Medical Student Association (AMSA) chapter of Avalon, student body, faculty and administration of Avalon University School of Medicine. A few of the services Avalon students performed were screening the public for body mass index, blood glucose, and blood pressure. Also, counseling was given to the public regarding healthy life style, diabetes, hypertension, obesity and how to change these modifiable risk factors. More than 500 people were in attendance, and the community appreciated the enthusiasm, knowledge, and services provided by Avalon University.